The UN Climate Conference (COP 20) concluded in Lima last 13th December after 12 days and 33 extra hours of negotiations, with a far more disappointing agreement that the more sceptical-minded would have dared guessing. Yet still, this was an important space to bring up our community-led climate justice solutions for the waste sector, which as much as it is often part of the climate problem, it can definitely be turned into a great climate solution. Following-up on previous commitments, countries meeting in Lima were meant to frame the new legal, binding, global agreement that is supposed to be adopted in the next COP 21 in Paris. This new treaty is expected to ensure climate action from 2020 onwards to keep the planet’s temperature rise below 2Cº. The outcome from Lima, far from bringing countries closer to a legally binding global treaty, delayed all the important and most controversial decisions and produced a shy ‘Lima Call for Climate Action’, a document that puts forward a number of key recommendations, without any real mandate for countries to pursue them. Apart from the big picture negotiations, the COP20 was a very relevant space to monitor and analyse specific country efforts to implement climate action in the waste sector. Precisely, several experiences have shown that whereas waste is part of the climate problem as a source of GHG emissions, it can definitely be turned into a key climate solution with greatest emission savings and further co-benefits. 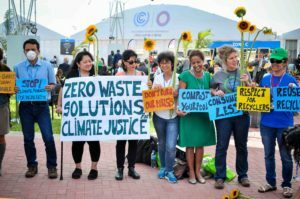 As done in previous years, GAIA organized a delegation of representatives of grassroots recycling workers, visionary local leaders, and innovative practitioners that showed that zero waste is a key strategy for climate justice and to develop a low-carbon economy. Throughout a week of action both inside the COP and also outside at the People’s Summit for Climate Change, the delegation engaged in promoting community-led climate solutions in the waste sector and also challenged the misleading assumptions around waste burning as a clean energy and/or renewable energy source. Starting the week with a colourful and exciting public action at the heart of the COP, the delegation pointed out at the current lack of environmental criteria in climate finance, most noticeable in the under-construction policies of the Green Climate Fund. 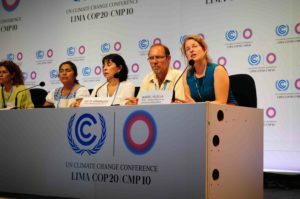 This institution, which has received financial pledges from developed countries to up to 10 USD billion during the COP20 and that may be approving project proposals as early as next summer 2015, has refused so far to commit to an ‘exclusion’ list of projects which would ensure that none of this eventual money ends up burning fossil fuels, municipal solid waste, biomass or producing any sort of dirty energy. Several civil society organizations have joined efforts to raise this demand, yet to be considered by the GCF Board. Specific action was taken to put the Mexico government on the spotlight, as it has recently granted permission to use municipal solid waste as fuel in cement plants all over the country. Doña Venancia Cruz, representative of the Indigenous Community of Santiago de Anaya in México, appealed directly to the government representatives bringing the testimony of her impacted community by this polluting practice. As mentioned above, the COP20 was an excellent context to show the key achievements of zero waste strategies in reducing GHG emissions, air pollution, providing livelihoods and restoring the soils. A press conference was held to showcase the specific examples. Dan Moche and Beth Grimberg from the Aliança Resíduo Zero Brazil presented the progress made in Sao Paulo, which as recently implemented source separation of organic waste and domestic composting for 10.000 homes. Compost from green waste — everything from household food scraps to dairy manure — avoids methane emissions from waste disposal and most importantly, it contributes to soil restoration and helps increase its capacity to act as carbon sinks. The effect is cumulative, meaning the soil keeps absorbing carbon dioxide even after just one application of compost, as compost decomposition provides a slow release fertilizer to the soils leading to an increase in carbon sequestration and increased plant production. Special attention was given to the contribution of the recyclers community, represented by Denisse Moran from REDLACRE. The recycling sector, with more than two million informal recyclers in developing country cities, offers climate-smart urban solutions to sustain and strengthen livelihood development, improve local environmental health, and strengthen local economies. Last but not least, representatives from the Coalición Anti-incineración Argentina stressed the need to work at the local and national level and root climate solutions on the basis of communities and national coalitions of civil society organizations. Monitoring national climate policies in the waste sector. As mentioned above, the COP20 is a very useful space to monitor and analyse national climate mitigation policy – aka NAMAs, Nationally Appropriate Mitigation Actions, in the UNFCCC jargon. As the global agreements have not offered any solid environmental guidance, the current situation shows a wide variety of climate mitigation policies, often in the wrong direction. This is particularly obvious when looking at the waste sector in countries such as Colombia, Indonesia and Dominican Republic. Colombia for example, which is known to host one of the most vibrant grassroots recyclers movements recognized internationally, presented a climate mitigation policy that will entail the implementation of an MBT plant in two cities, with the subsequent production of Refuse-Derived Fuel to be burnt in cement plants as an emission reduction strategy. The polluting impacts of waste burning in cement kilns have been thoroughly reported. Worryingly enough, Dominican Republic also presented a climate mitigation project with the support of GIZ consisting in burning of used tires in cement kilns, arguing that it would not only reduce GHG emissions but it would also benefit the local population via job creation. Likewise, the climate mitigation policy presented by Indonesia also makes a reference to developing 5 waste-to-energy projects in 5 different cities, even thought it’s unclear what kind of technology it will be. On the other hand, the Dominican Republican also presented a project to apply anaerobic digestion to pig farming, which could indeed contribute to GHG emissions if done appropriately. 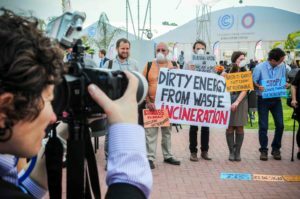 In this sense, it was made clear that when it comes to climate mitigation policies in the waste sector, the UNFCCC is unable to provide any solid environmental and social criteria and it needs close monitoring to discern the good, the bad and the ugly. The COP21 in Paris will take place next December and the National Climate Coalition 21 is already gearing up to it. International networks had a chance to discuss plans at the People’s Summit in Lima and put forward a calendar of decentralized mobilizations for the whole year. Once again, community-led zero waste solutions will be at the front of the mobilizations, showing the work done throughout the whole year at the local and national contexts. 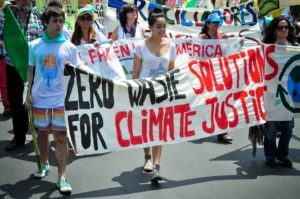 For a comprehensive analysis of the COP20 outcomes, we recommend the following article by Oscar Reyes, at Institute for Policy Studies, and also this article by Lili Furh, Liane Schalatek and Maureen Santos at Heinrich Boell Foundation. See http://www.marincarbonproject.org/marin-carbon-project-science for the latest bibliography on this work.